Illustration by collaborator Miranda Hoffman. Every year, a third of U.S. Military servicemembers move. Their spouses move right along with them, cutting them off from the friendships they depend on. 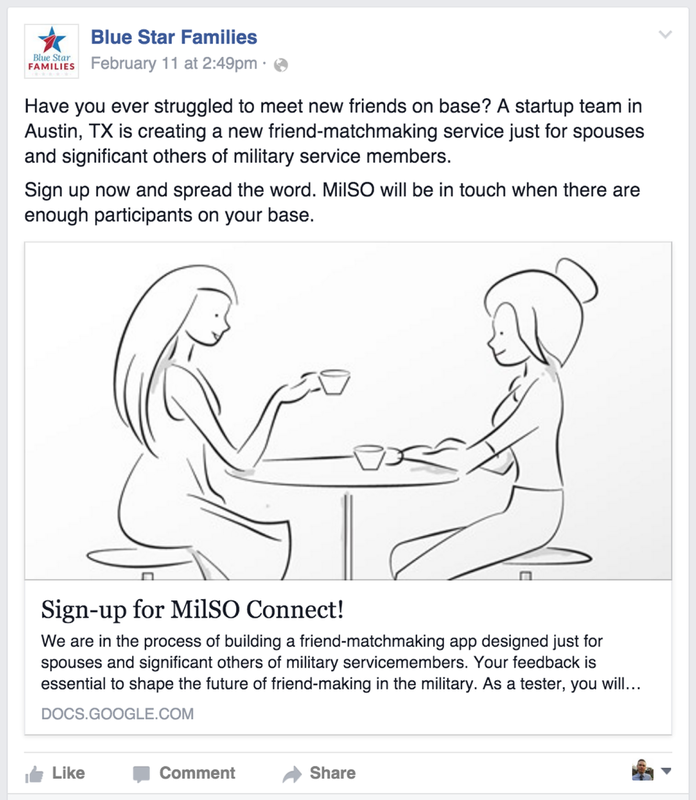 MilSO is a mobile application that makes it easier for military spouses to make and maintain friendships. I’m one of three designers collaborating on the project. Our team’s aim was to better understand the lives of military families and build empathy for them as a driver for the rest of the design process. Being relatively unfamiliar with the space, we began with a broad spectrum of inquiry ranging from family dynamics to access to health and social services. To get past the surface and into richer, more provocative qualitative data, our team was graciously allowed into the homes of several military families, including on-base housing at Ft. Hood. We went on home tours and were shown personal items pertaining to each family’s military experience, all the while listening intently and digging into the details of their stories. Sifting through hundreds of individual utterances and photographs, we identified patterns, interpreting them to build insights about the lives of military families. By mapping the qualitative data visually, we began to paint for ourselves a picture of the challenges that military families face. What became clear is that the spouses at home are often left with the lion’s share of the responsibility for maintaining the household. This is especially challenging because military life makes it difficult to make and maintain relationships with those who could lend a hand or even just an ear to listen. Transient military families struggle to build deep relationships vital to security and reliability. The design must provide tools to foster the development and maintenance of deep, supportive relationships. Knowing the high-level goals for the design gives us a bridge to start sketching. There are any number of ways that a complex social problem like this one can be approached. We generated a diverse set of ideas before narrowing in on a smaller group to develop further and test. All the while, our research kept us tethered to the problem space. The lowest fidelity napkin sketches are done just to get the ideas out and make them real, however small and fragile they may be. At this point, the name of the game is volume over quality. For this project, we generated hundreds of sketches, attempting to push ourselves outside of the realm of obvious ways to address the problem. While napkin sketches are enough to document the core of an idea, a mid-fidelity vignette breathes a bit of life into it. Some detail has been considered and most people could look at it and believe that it could turn into a real boy. This level of expression allowed us to tell the story of the product as an end-to-end experience, as much to ourselves as anyone else. The polished, high fidelity version makes the idea accessible and changes the conversation. It’s no longer about the concept, but about the details. Did we get the padding right, the colors, the icon style. Careful fit and finish leads to consistency and will allow us to clearly communicate with developers. To uncover greater detail about what the service should look like, including behind the scenes, we created a service blueprint. This allowed us to think through the required sections of the interface, the backend infrastructure, and any supporting resources outside of the system proper. It’s one thing to tell a story about something that doesn’t exist yet. It’s another to make it real. Prototyping allows us to test our assumptions early, to see how our nascent ideas play out with real users. Our prototypes for this project ranged from printed wireframes to a small-scale friend matchmaking service conducted via email. One of our hypotheses was that meeting up in person and spending time together would be an essential component to the creation and development of friendships. It sounds basic, but although we knew military spouses were interested in hanging out with new friends, we didn’t know yet whether they would be interested in using a service to make that happen. 1. We solicited feedback from past participants through follow-up interviews and think-aloud testing. 2. We asked military spouses to sign up by advertising the availability of the service on social media. 3. We recruited a proxy population—college students and acquaintances interested in meeting new friends—to participate in a small-scale friend matchmaking service which we ran through email. One interesting finding is that men may have a harder time acclimating to the use of a service to make friends. And since not all military spouses are women, this is a challenge we are going to have to wrestle with. Perhaps most importantly, we learned that having a mutual friend in common can be a very powerful way to encourage the development of a new friendship. Again, this is a very basic idea in hindsight. However, we plan to explore ways to identify and leverage mutual connections more explicitly in the design moving forward. The development of the project is ongoing. What we’ve learned so far has given us confidence that the concept could be desired and valuable if we are able to scale successfully. We are moving into a pilot phase where we will be testing the design directly with the population for whom it is intended.